So Mother called me to say my favourite film was on. 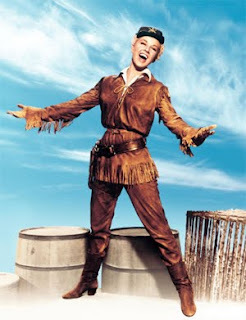 Calamity Jane with the wonderful Doris Day! I was so excited and as I now watch it, i am reminiscing of things I used to sing along or do when watching this as a kid. On the above clip I would ask what she was saying...asking my Mother "what's that bit she says...I've got the 'durisdict' something to be wherever you aint?" "I've got the darnest itch in me, to be wherever you aint!" Mother might remember all of a sudden alot of salt being used up and somehow ending up on the kitchen floor! Check out 1.17 on the above clip! I used to clean my room singing this song...how silly I am to share that! Well, I am going to get on with watching Calamity Jane and hope you all get to see it! Glad you enjoyed it - yes, for the first time in years the kitchen floor is salt free after this film has aired ! Now all I have to do next time you are ill is remind you to watch 'Father Goose' - Qu'est-ce que warts ?